We hope you have had a happy and easy transition back to school! As school ramps up so does your child’s homework. This means heavier and heavier backpacks are being lugged to and from school. We want to make sure you and your kids avoid injury and pain by giving you tips of how to properly pack, lift and carry a backpack. The American Occupational Therapy Association has named September 16th National School Backpack Awareness Day to help educate parents, educators, and kids on the dangers of heavy or improperly worn bags. In one study with American students ages 11 to 15 years, 64% reported back pain related to heavy backpacks. Twenty one percent reported the pain lasting more than 6 months. In a study on the effect of backpack education on student behavior and health, nearly 8 out of 10 middle school students who changed how they loaded and wore their backpacks reported less pain and strain in their backs, necks, and shoulders. Arrange books and materials so they won’t slide around in the backpack. Check what your child carries to school and brings home. Make sure the items are necessary for the day’s activities. Distribute weight evenly by using both straps. Wearing a pack slung over one shoulder can cause a child to lean to one side, curving the spine and causing pain or discomfort. Select a pack with well-padded shoulder straps. Shoulders and necks have many blood vessels and nerves that can cause pain and tingling in the neck, arms, and hands when too much pressure is applied. Adjust the shoulder straps so that the pack fits snugly on the child’s back. A pack that hangs loosely from the back can pull the child backwards and strain muscles. Wear the waist belt if the backpack has one. This helps distribute the pack’s weight more evenly. The bottom of the pack should rest in the curve of the lower back. It should never rest more than four inches below the child’s waistline. School backpacks come in different sizes for different ages. Choose the right size pack for your child as well as one with enough room for necessary school items. S. Consumer Product Safety Commission National Electronic Injury Surveillance System (NEISS) Database (2007.) Numbers quoted are the estimated figures. Hu, J., Jacobs, K., & Pencina, M. (Submitted for publication). Backpack usage and self-reported musculoskeletal discomfort in university students. In my previous blog post, I introduced the Voice Box, a motor speech lab that houses equipment related to voice, resonance, and articulation. The first post was primarily centered around the Smart Palate technology by Complete Speech. Now I am here to tell you more about the other stars of the Voice Box, the Nasometer and the Visipitch. 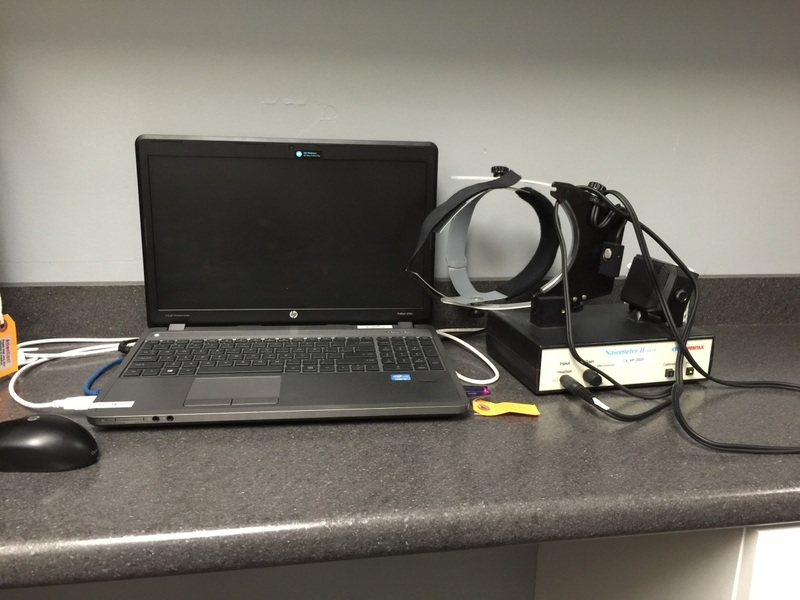 Above pictures include computer with headset (worn by client) that takes nasalance measurement. So what is the Nasometer? The Nasometer is an evaluation and treatment device that is able to objectively measure nasality (resonance) in a client’s speech. 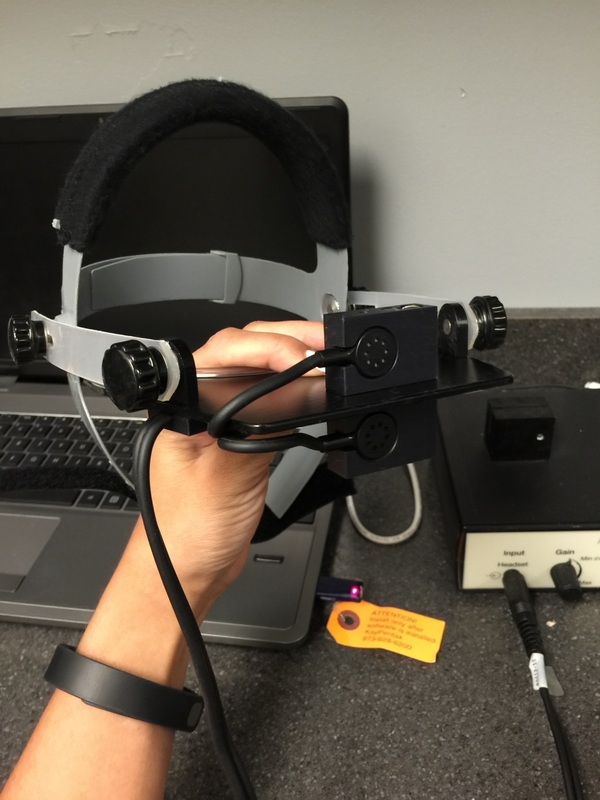 Prior to this piece of equipment, clinicians were using their own perception or ear to determine if a client had a nasality problem. This takes the guess work out! Provides a nasalance score that objectively measures nasality. Helps clinicians determine if further evaluation is needed to assess the velopharyngeal port by ENT or craniofacial clinic. Allows clinicians to objectively measure progress in therapy for children with resonance disorders by improvements in nasalance scores. How is it used in treatment? The Nasometer has biofeedback games that can be used in treatment and allow the child to practice appropriate resonance in real time speech. The child is able to make adjustments based on feedback they are receiving in fun, highly motivating computer game. 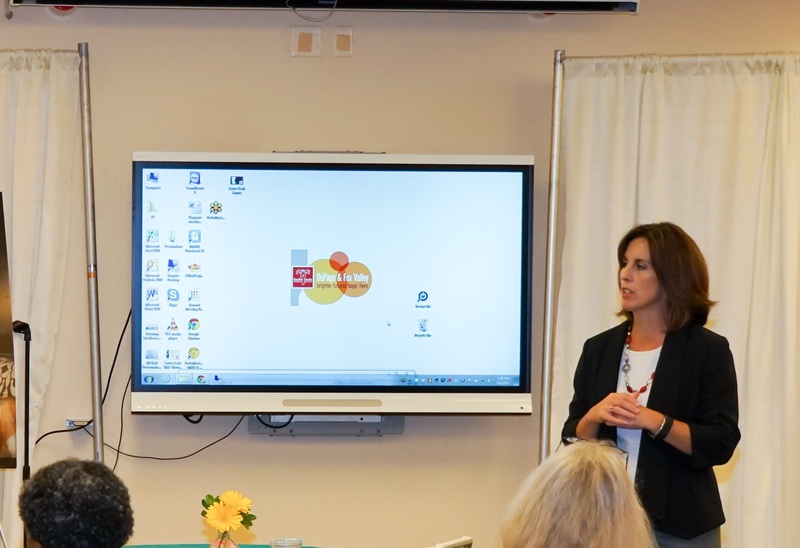 The Visipitch can be used for a variety of skills and has various programs targeting different aspects of speech. The visipitch is an all-encompassing instrumentation that gives real time displays for visual feedback of critical speech/voice parameters. Contains 8 modules all used for different/various speech skills. 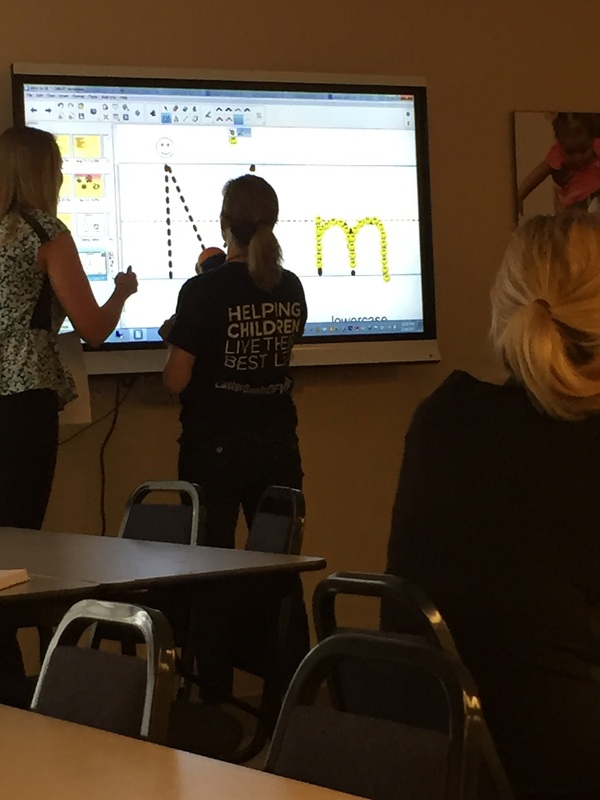 How do we use this technology at Easter Seals DuPage and Fox Valley? We mainly use the Multi-Dimensional Voice Program (MDVP) to evaluate voice disorders contained in Visipitch software and Voice Games. Clinicians can measure progress in therapy based on improvements in quantitative measures provided by MDVP. Who would benefit from this piece of equipment? Voice games work on sustained phonation, frequency/pitch of voice, amplitude/loudness of voice, voice onset, etc. The frog game (below) . Child is asked to sustain phonation or hold out voice to expand frog’s throat. 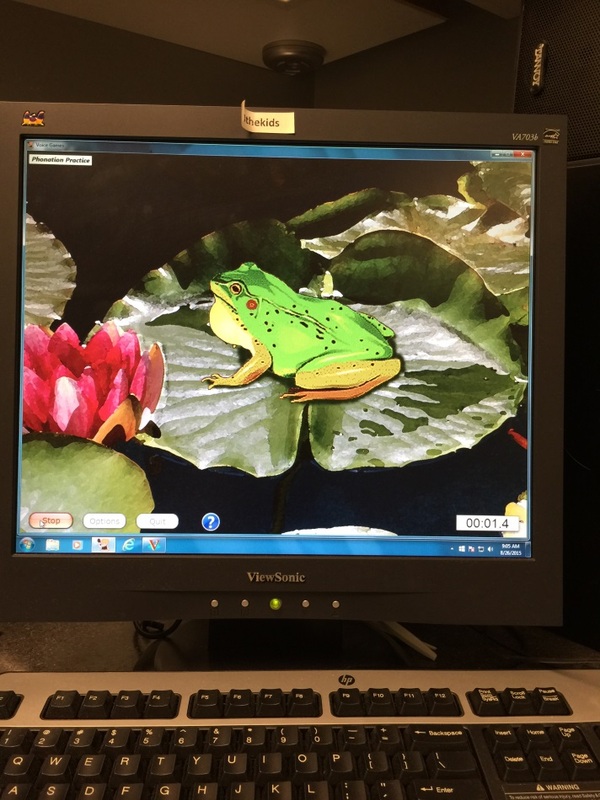 If child holds out voice until frog’s throat expands, they are awarded with a visual reinforcement on the screen. Dragon/Fire game (below). Child is asked to use low to loud vocal volume to pop all the balloons with the dragon’s fire. This game works on vocal loudness and ability to control vocal loudness. Of course, these pieces of equipment are never used solely in treatment. All equipment is used in addition to traditional speech treatment! If you have questions or are interested in having your child evaluated for use of the Voice Box, please contact our intake coordinator at 630.282.2022. 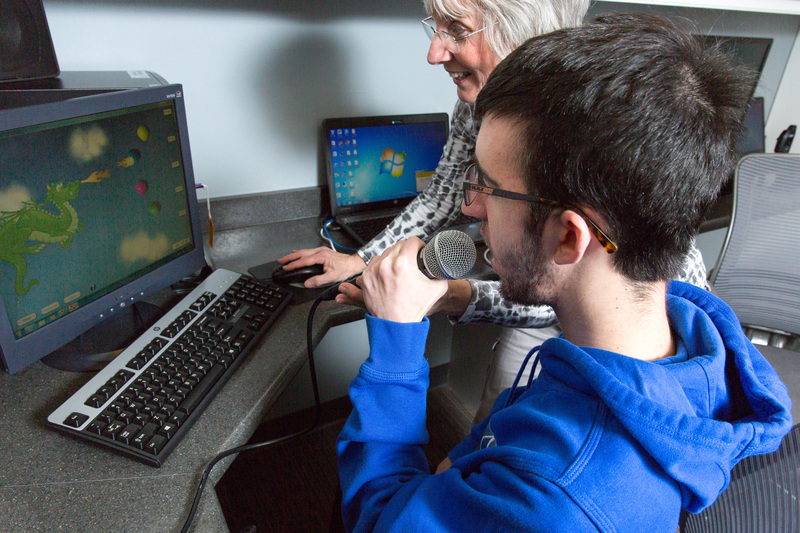 The Voice Box has been a wonderful addition to the Speech and Language Department at Easter Seals DuPage & Fox Valley! We are forever grateful to the generous donors who made this possible! Thank you again!